We all want our photos to be liked. That’s why we spend that extra time tweaking them before sharing them with the world on various platforms. Photo editing apps on smartphones have become a necessity nowadays as today’s photo editing apps make it easier than ever to enhance, crop, remove blemish, add effects and filters and more. Photo editing on android is still in a stage where you can do only the most basic edits. However, apps are coming out all the time that add more functionality and mobile users have more to do with their photos. In the list below we’ll explore the best apps for fine tuning your shots to look perfect. Snapseed is a photo editing app for android that is useful for people who seek professional editing features on their mobile devices. This app isn’t flashy, but offers a simple and efficient way to start editing and tweaking your photos. You can grab stuff from your phone, including your camera photos and anything else you have saved to your device. It also hooks into cloud storage options like Box, Google Drive and Microsoft’s OneDrive. Snapseed has enough tools to allow fine edits to be made to the pictures. Snapseed is known primarily for its filters – Retrolux, Vintage, Tilt Shift, Grunge, Drama and other cool effects. The best thing about this app is that it is completely free of charge and has no ads. Can’t wait to try it out, right? PhotoDirector is a multi-purpose photo editor which can quickly and easily add overlay to your images with effects and different photo styles. The app debuts with useful and impressive editing features including smart object removal. You can select an object and the app intelligently creates a magnified view of where you are painting with your finger, which makes it easy for faster masking. 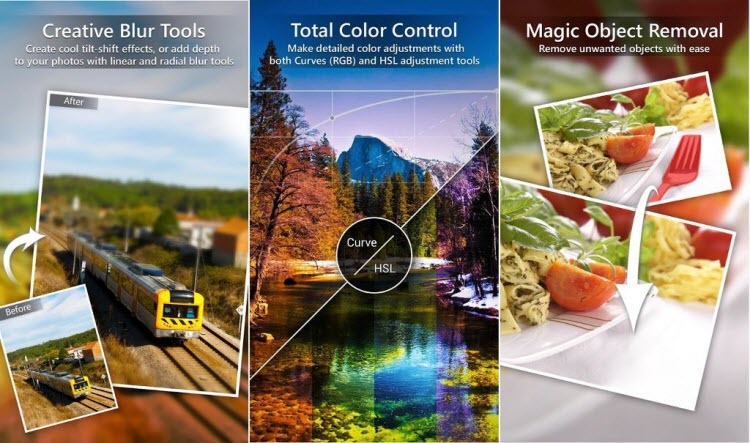 This photo editor app for android gives you plenty of powerful features to edit your picture with advanced features like RGB curves and HSL tools. 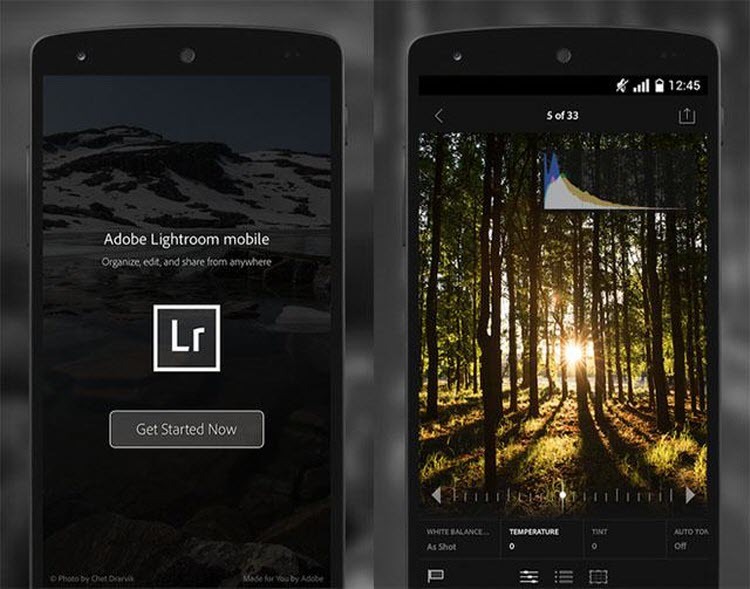 Adobe recently launched a photo editing app called Lightroom, for android phones. It allows editing of RAW image format and the ability to enhance photos with a range of preset and tools. This mobile version of Lightroom is useful for people who are been using Lightroom on other platforms, being already familiar to the software makes it easy for them to use the app. The app is a 30-day trail but those who have a Creative Cloud subscription can go beyond the specified limit. Afterlight is a great app for android users as it includes of extensive filters and for your photos and allow quick social sharing. There are 59 filters, 66 different film textures and 77 adjustable frames to tweak your image with. Its gives you roughly 300,000 combination of filters, frames and textures. 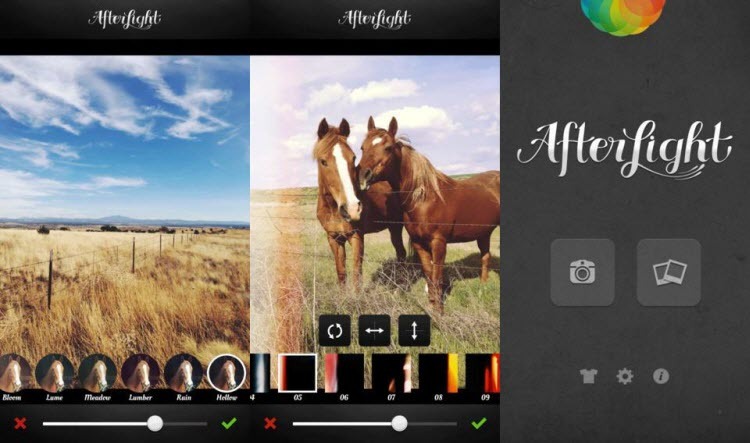 Afterlight still handles all your traditional photo editing tools. It is the perfect image editing app for android smartphones. 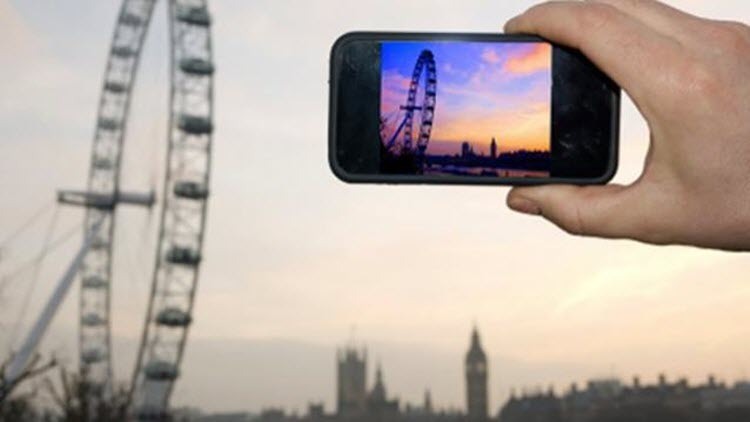 Go ahead and use this amazing app to satiate your photography desires. Spinly offers a light version of photo editor on android, which is perfectly optimized for someone who wants to access fancy filters and effects which other apps have without all the unnecessary fluff. You’ll also find a light leak feature that’s unique to Spinly with a various angles to give your photo that professional-amateur look. It might not be for everyone, but it’s cool to have the feature regardless. Spinly is a very simple app to jump onto so this might be worth for the people who want a lightweight photo editor app for their android phone. Use these useful photo editing apps for android smartphones and make your shots look perfect for social sharing. Share your views and opinions in the comments section below. We would love to hear about any other that you feel could fit this list.